North-West College and Glendale Career College celebrated together as more than 900 graduates from eight campuses in Southern California earned diplomas in allied health care programs. On Sunday, November 9, 2014, more than 3,000 people gathered in Pasadena, California to celebrate as graduates from North-West College and Glendale Career College earned their diplomas. This was a momentous day for more than 900 graduates ranging from 18 to 60 years in age as they celebrated their achievement with fellow graduates, friends and family. The graduates, who all completed their required coursework, were presented with diplomas from nearly a dozen different allied health care programs including Vocational Nursing, Surgical Technology, Medical Assisting, Pharmacy Technician, Diagnostic Medical Sonography, Dental Assisting and Massage Therapy. The ceremony was held in the Pasadena Civic Auditorium, in Pasadena California. This was a significantly different event compared to the first North-West College graduation ceremony, which was held in a single classroom at the West Covina campus in the 1960’s. Since that time, North-West College and Glendale Career College have celebrated the success of more than 45,000 graduates. Special guest speaker Paul Heredia, Chief Human Resources Officer for Citrus Valley Health Partners, delivered the keynote address. Mr. Heredia, a graduate of California State Polytechnic University and the Executive Management Business Program at UCLA, captivated and inspired the audience with his own personal success story, as he praised the support he received from the three most important women in his life: his mother, his wife and his daughter. 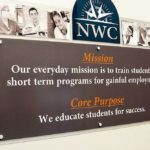 The mission of both North-West College and Glendale Career College is to prepare students in short-term programs for gainful employment. The success of this graduating class proves that both colleges are excelling at achieving their mission as they continue to provide diverse programs that produce capable graduates well-prepared for new careers in health care. North-West College (NWC) was founded in 1966 by Marsha Fuerst. Mrs. Fuerst’s family has been involved in the allied health field since the early 1950’s and North-West College continues to be owned and operated by Mrs. Fuerst’s son, Mitchell Fuerst. Today, North-West College has seven campus locations in the cities of West Covina, Pomona Valley, Pasadena, Glendale, Riverside, Santa Ana, and Long Beach. These schools, plus Glendale Career College and Nevada Career Institute comprise Success Education Colleges (SEC). The College provides a professional, career-orientated educational experience, with enthusiastic support for all students in a multi-cultural environment. With over 45,000 graduates to-date, North-West College is your Direction to Success. For more information about North-West College and its programs visit www.nw.edu or contact Michelle MacIntyre at michellema@success.edu or call 626-960-5046. Glendale Career College (GCC) has over 60 years of history in Southern California and serving the Glendale community. Glendale Career College is owned by Success Education Colleges, along with North-West College and Nevada Career Institute. Glendale Career College is an allied health career college that offers students short-term training programs that give them skills to become part of the ever-growing health care field. For more information about Glendale Career College and its programs visit www.GlendaleCareer.com or contact Michelle MacIntyre at michellema@success.edu or call 818-243-1131.